This is the second in a series in which I give the blueprint for my Mac Media Server. These pages will be updated with new software and settings changes so they will always be up to date with my current configuration. This is the second part of the series which describes the process of transferring the media from my old iTunes Library to that of the new Mac Mini’s. 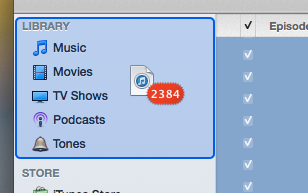 My next step of transferring my iTunes Library was relatively easy. Thanks to the help of Home Sharing, moving your iTunes Library to a new computer is a breeze. I just turned on Home Sharing on the Mac Mini — clicking on Home Sharing in the sources list and then logging in with my iTunes credentials. Now every computer running iTunes, every Apple TV, iPad, iPhone, and iPod touch on my network can stream media from the Mac Mini’s library. And, the Mac Mini can transfer files from other shared iTunes Libraries to the Mini’s iTunes Library. To move all of my media files from my old computer to the Mac Mini I selected my old iMac from the sources list in iTunes, selected all (with command+a), and drag and dropped the files into the new iTunes Library. After a few hours all of my media files were in one place. If there’s any media files that are found to be missing (probably Books, Apps, or Ringtones) they can easily be moved with an external hard drive, file sharing over the network, or a thumb drive. All of iTunes’ media files can be found in your Home folder’s Music folder and then drag and dropped into the Mac Mini’s iTunes Library. With Home Sharing turned on and all of my media in one place, this was enough for me to get most of my media server up and running. 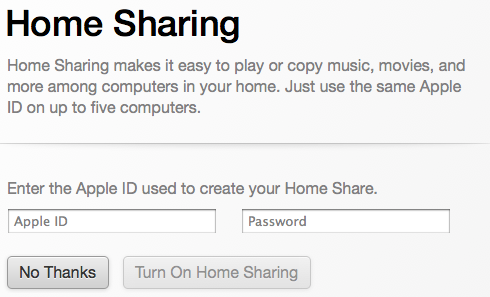 Any other device on the network that had Home Sharing turned on — Apple TV, iPad, iPhone, etc. — is now able to stream media from the Mac Mini.